Whether you were away from the Lowcountry for a week or for years, it was impossible to remember how gorgeous it was. It never changed and everyone depended on that. Newly graduated from college and an aspiring writer, Beth Hayes craves independence and has a world to conquer. But her notions of travel, graduate study, and writing the great American novel will have to be postponed. With her mother, Susan, leaving to fulfill her own dreams in Paris and her Aunt Maggie, Uncle Grant, and stepfather, Simon, moving to California, Beth is elected by her elders to house-sit the Island Gamble. Surrounded by the shimmering blue waters of the Atlantic, the white clapboards, silver tin roof, and confessional porch have seen and heard the stories of generations of Hamiltons. But will the ghosts of the Island Gamble be watching over Beth? 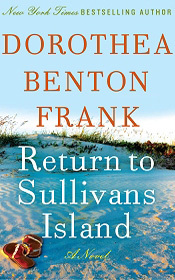 Sullivans Island and the Island Gamble are very special to Dorothea Benton Frank and her characters. What does the island and their beloved home mean to the Hamilton and Hayes families? What does it mean to Beth? Do you have a special placeor a special retreatof your own? If not, what kind of "Island Gamble" would you want? What would you call it? When she returns from college in Boston, Beth remarks on how Sullivans Island has changed. Has your own hometown changed? If so, how? How do you feel about those changes? When she arrives on Sullivans Island, Beth has some interesting thoughts about the place. "In her heart she felt the island really belonged to her mother's generation and those before her." BY the novel's end, do you think Beth has made her own claim to the island? Why? The Hamilton/Hayes are extraordinarily close. What benefits does such closeness offer? Can there be a downside to being so close? How does this closeness influence Beth as she grows into a woman? How does Beth see her family and her role in it? What factors influence her viewpoint? How does distance affect her perspective: both her own, going to college in Boston, and her mother Susan's when she goes to Paris? Beth also muses about her family: "The last four years had prepared her to live her own life, independent of her tribe. Isn't that why she went to college a thousand miles away in the first place?" Is that the purpose of college? Is Beth more or less independent by the story's end? Describe Beth's relationship with the women in her life: her mother, Susan, her aunts Maggie and Sophie, her friend Cecily, even her editor Barbara Farlie, their importance to her and how they shape her. Determined to do her duty to the family, Beth's "intention was to avoid any and all controversy and every kind of chaos." Why does it seem that the best of intentions often go awry? Beth was long wary of intimacy with men. "In her mind there was nothing more dangerous that what her mother called love." How does this mindset affect her when she meets Max Mitchell? Discuss Beth's affair with him. Why is she attracted to him? What does Beth think about Woody Morrison? How do her relationships with Max and Woody contrast? What does each man offer her? Beth and Susan both lost their fathers at a young age. How does this loss color different aspects of their lives? Susan had always dreamed of living in Paris, but circumstances cut her stay short. Yet Susan isn't disappointed. Why? Is it always better to realize our dreams? Is there a benefit in leaving some unfilled? Dorothea Benton Frank has a gift for bringing the wild beauty and magic of the Lowcountry to life. How do you picture the Lowcountry? Is it a place you'd like to visit? If you have been there, how do your impressions compare to those in the novel? One of the charms of the Island Gamble is that it is haunted. Do you believe in ghosts? Have you had any interesting experiences with the supernatural? The author touches on the subject of race with grace and compassion. As Beth enjoys her close friendship with Cecily she thinks of the strictures placed upon her mother and Cecily's grandmother, Livvie. How else have changing social mores freed us over the years? Family, independence, love, marriage, race, heartbreak, acceptance, trust, and change, are all themes interwoven in the novel. Using examples from the book, explain the role of each and how they evolve in the story's arc.